March 2015 n Performance & Hotrod Business n 77 What's wrong with that? Many businesses feel there's a lot wrong with that. In the early days, Facebook was a level playing field for businesses of every size, including small startups, non-profits and entrepreneurs. We quickly learned the rules of engagement and were excited about the oppor- tunity to reach people who were genuinely interested in our business, service or mission. As long as we were providing relevant, timely, engag- ing, authentic content to our audiences, responding quickly and professionally to questions and concerns, and behaving ethically and transparently within the Facebook space, us little guys could swim with the big fish—and that was inspiring. As Facebook for business becomes a "pay-to-play" landscape, that changes. Some businesses have become so disenchanted with the many recent changes that they've closed their accounts entirely—even with substantial fan bases. Take EAT24's Breakup Letter to Facebook. The company publicly left Facebook with about 70,000 page fans. (http://blog.eat24hours.com/ breakup-letter-to-facebook-from-eat24/) Is there any good news? 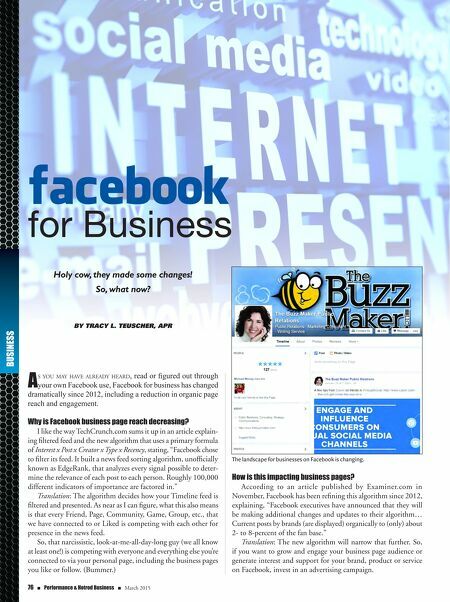 If you're ready to use your Facebook business page as a strategic communication channel, then yes. 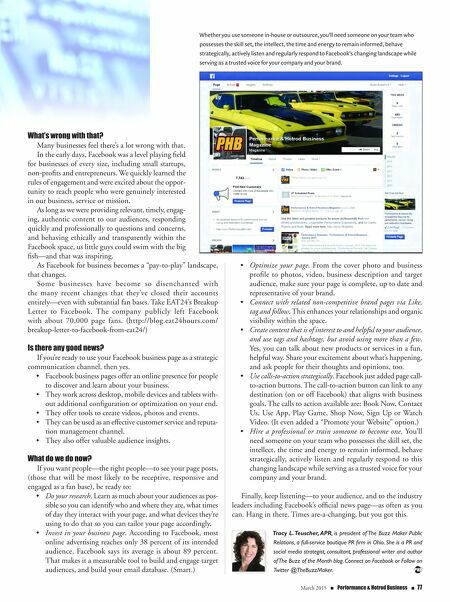 • Facebook business pages offer an online presence for people to discover and learn about your business. • They work across desktop, mobile devices and tablets with- out additional configuration or optimization on your end. • They offer tools to create videos, photos and events. • They can be used as an effective customer service and reputa- tion management channel. • They also offer valuable audience insights. What do we do now? If you want people—the right people—to see your page posts, (those that will be most likely to be receptive, responsive and engaged as a fan base), be ready to: • Do your research. Learn as much about your audiences as pos- sible so you can identify who and where they are, what times of day they interact with your page, and what devices they're using to do that so you can tailor your page accordingly. • Invest in your business page. According to Facebook, most online advertising reaches only 38 percent of its intended audience. Facebook says its average is about 89 percent. That makes it a measurable tool to build and engage target audiences, and build your email database. (Smart.) • Optimize your page. From the cover photo and business profile to photos, video, business description and target audience, make sure your page is complete, up to date and representative of your brand. • Connect with related non-competitive brand pages via Like, tag and follow. This enhances your relationships and organic visibility within the space. • Create content that is of interest to and helpful to your audience, and use tags and hashtags, but avoid using more than a few. Yes, you can talk about new products or services in a fun, helpful way. Share your excitement about what's happening, and ask people for their thoughts and opinions, too. • Use calls-to-action strategically. Facebook just added page call- to-action buttons. The call-to-action button can link to any destination (on or off Facebook) that aligns with business goals. The calls to action available are: Book Now, Contact Us, Use App, Play Game, Shop Now, Sign Up or Watch Video. (It even added a "Promote your Website" option.) • Hire a professional or train someone to become one. You'll need someone on your team who possesses the skill set, the intellect, the time and energy to remain informed, behave strategically, actively listen and regularly respond to this changing landscape while serving as a trusted voice for your company and your brand. Finally, keep listening—to your audience, and to the industry leaders including Facebook's official news page—as often as you can. Hang in there. Times are-a-changing, but you got this. Tracy L. Teuscher, APR, is president of The Buzz Maker Public Relations, a full-service boutique PR firm in Ohio. She is a PR and social media strategist, consultant, professional writer and author of The Buzz of the Month blog. Connect on Facebook or Follow on Twitter @TheBuzzMaker. Whether you use someone in-house or outsource, you'll need someone on your team who possesses the skill set, the intellect, the time and energy to remain informed, behave strategically, actively listen and regularly respond to Facebook's changing landscape while serving as a trusted voice for your company and your brand.